The classic Indian Khichdi is probably one of the simplest and quickest made complete meal. A combination of Basmati Rice and Yellow Moong Dal completed with a tasteful Ghee and Cumin Seed tempering, Khichdi is a light and healthy meal that is also ideal for infants. 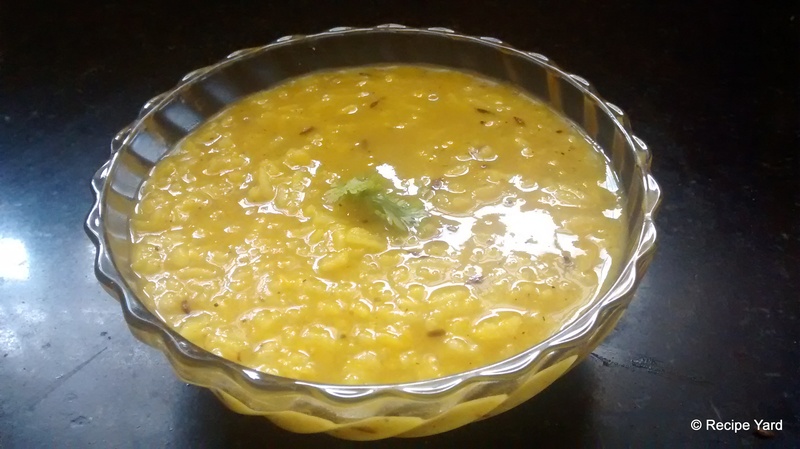 Wash the rice and dal together with water 2 – 3 times. Put the rice and dal in a pressure cooker along with the salt, turmeric powder and water. Place the pressure cooker on medium-high heat. Let it come to a whistle and immediately after the first whistle, lower the flame and let the khichdi simmer for 5 – 7 minutes. Turn off the flame and wait for the steam to completely escape from the cooker. Note: If you do not have a pressure cooker or want to cook the khichdi without it, soak the rice and dal together in 2.5 cups water for an hour prior to cooking. Then put it in a deep pan with the water on medium-high heat. Let the dal and rice cook in the boiling water until both completely boil, even blend together slightly. Then turn off the gas. Place a small frying pan over medium-high heat and pour the ghee in it. As soon as the ghee heats up, add the cumin seeds to it. If using, add the garam masala and remove the pan from the flame. Immediately add the tempering to the ready khichdi and stir it. Transfer the khichdi to a serving dish and top with fresh coriander / cilantro if desired. Serve hot! Thank you so much for that feedback. It is really encouraging. We will try our best to put up great recipes in the future too!